Over the past four decades, the links between disarmament and issues of development or global inequality have been the subject of General Assembly resolutions, UN reports, and occasionally more intensive consideration by states. This agenda originated in concern at the impact of the global arms race on social and economic development during the Cold War. More recently, a reappraisal of the relationship between disarmament and development by a Group of Governmental Experts was released in 2004.3 Reaffirming the core concerns and evidence regarding military expenditure and economic development, the report also elaborated on other threats to safety, stability, and development objectives that can result from the trade and use of certain weapons (such as landmines and small arms). Every year, a resolution is introduced to the First Committee on behalf of the Non-Aligned Movement (NAM) on the relationship between disarmament and development, requiring the UN Secretary-General to report on this issue. 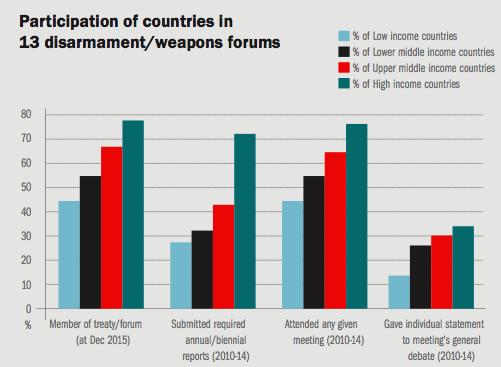 Disarmament and weapons issues are of global concern – with developing countries also often more negatively affected by the use and trade of weapons, and less likely to be major arms producers. A diverse range of interests must be fully represented at international forums for any attempt to construct an equitable international legal order that reflects the concerns of populations worldwide. Research also suggests that diverse multilateral forums are more productive.5 Developing countries and their civil society are currently relatively marginalised from agenda setting and decision- making in disarmament through their structural underrepresentation. This must be addressed. Sixteen of the fifty-seven resolutions adopted at the First Committee in 2015 reflected one or more of these themes. A resolution on disarmament and development was adopted, with explanations of vote from the US noting that it considers disarmament and development two separate issues, and the UK and France questioning the negative relationship between development and military spending. In recognition of this, as well as of the greater negative impact of armed violence on developing countries, recognise the need to address the issue of the underrepresentation of lower-income countries and certain regions in multilateral disarmament forums, and suggest practical measures. The integration of gender and humanitarian perspectives, and ensuring gender diversity and the meaningful participation of those who have been most affected by the issues under consideration, should also be recognised as crucial. Raise the visibility of marginalisation by supporting the consistent collection, monitoring, and analysis of participation data, to improve awareness and measure progress. 1 Report of the international conference on the relationship between disarmament and development, A/CONF.130/39, 1987. 2 Report of the Secretary General: The Relationship between Disarmament and Development, A/35/356, Department of Political and Security Council Affairs, United National Centre for Disarmament, 1982. 3 The relationship between disarmament and development in the current international context, A/59/119, UN General Assembly, 2004. 4 Elizabeth Minor, Disarmament, Development and Patterns of Marginalisation in International Forums, Article 36, 2016, http://www.article36.org/wp-content/uploads/2016/04/A36-Disarm-Dev-Marginalisation.pdf. 5 John Borrie and Ashley Thornton, “The Value of Diversity in Multilateral Disarmament Work,” United Nations Institute for Disarmament Research (UNIDIR), 2008, http://unidir.org/files/publications/pdfs/the-value-of-diversity- in-multilateral-disarmament-work-344.pdf. 6 “Discussion on disarmament and development at UN General Assembly First Committee,” Article 36, November 2015, http://www.article36.org/updates/d-d-1st-com. 7 Transforming our world: the 2030 Agenda for Sustainable Development, A/RES/70/1, UN General Assembly, 2015. State participation at the UN nuclear talks – who is represented?